Lineolated parakeets (Bolborhynchus lineola) are small parrots who originate from areas in Central and South America. The lineola part of the lineolated parakeet’s Latin name means “striped” for the fine lines on her plumage. Lineolated parakeets are affectionately called “linnies” by their owners and bird enthusiasts. In the wild, lineolated parakeets are nomadic, preferring to live 1500 metres or higher above sea level in the summer. In the winter, lineolated parakeets move to lower elevations around 600 metres above sea level. Lineolated parakeets generally live and move around in small flocks of about 20 birds on average. Because of their natural habitat lineolated parakeets can withstand large temperature changes and have been seen in snow. Lineolated parakeets are small birds, slightly larger than budgies (budgerigars). Tip to tail, lineolated parakeets measure about 16 cms and weigh around 50 grams. Lineolated parakeets have a stocky build and have short tails compared to other parrot species. Bath time is the best time! Lineolated parakeets are well known for their love of bathing. In captivity, lineolated parakeets enjoy being gently misted with luke-warm water. Lineolated parakeets are known for having several quirky habits and behaviours. Lineolated parakeets enjoy burrowing and those in captivity will bury themselves in blankets or in/under furniture. Lineolated parakeets love to walk and carry themselves almost horizontally when they move across branches. Like their larger parrot cousins, lineolated parakeets will pick up objects and food with their feet. 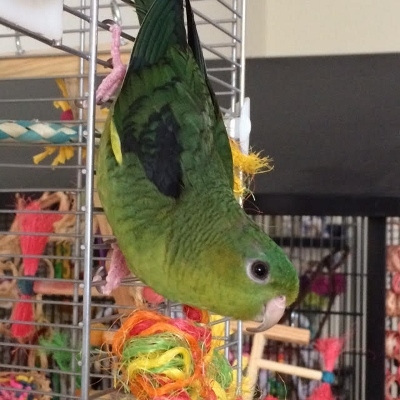 Lineolated parakeets also like to hang upside down! Compared to their larger parrot counterparts, lineloated parakeets are relatively quiet birds. While there are individuals who can be louder than others, lineolated parakeets generally communicate with soft chatter. Lineolated parakeets do have the ability to mimic sounds and human speech, but their vocabulary can be limited. While there are naturally green lineolated parakeets in the pet industry, there are captive birds with different colours. Selective breeding has created lineolated parakeets with vibrant colour mutations such as cobalt, mauve and lutino.